Perfection is just a lot of things done very well. Every little cog in your bug out machinery must be greased up and running flawlessly. This first aid kits review will remind you of the “cog” that deserves extra attention in survival scenarios. 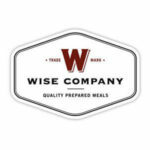 Administering immediate medical attention and cobbling up a proper first aid kit is what we’re talking about. Minor/major injuries and conditions can throw a wrench into the most elaborate of prepping agendas. Things like vehicle collisions, gunshot and knife wounds, falls from heights, and blunt impacts all require proper tools and skills for an adequate response. You’ll need to prepare yourself to deal with burns, blisters, broken bones, and ankle sprains, as well as frostbites, sunburns, and torn ligaments. All on the go and under stress. So, start working on your medical skills and we’ll show you some of the best first aid tools on the market. First aid is the stepping stone to successful survival. With advanced medicine, a cut or a broken bone won’t spell disaster. What if we take the government-sanctioned medical care out of the equation, though? You’re on your own before you know it! 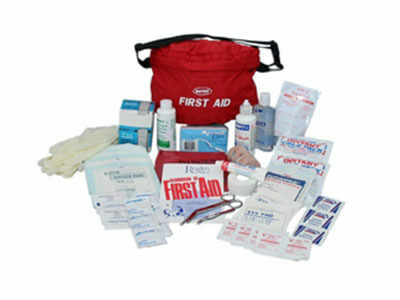 Fortunately, a good first aid kit can help save your health and your life. 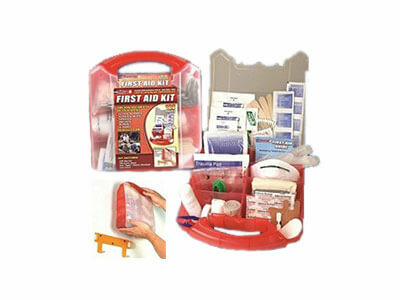 Read more about the kits we selected and choose a first aid kit you think is just right for you! 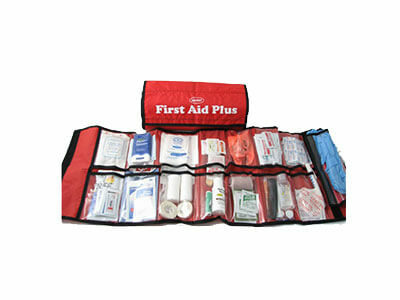 This is one of the two the most convenient first aid kits on the list. It’s the most compact too. The fanny pack is excellent if you have to take your survival scenario “to go.” It’s easy to carry around, which was the entire purpose behind its design. The actual kit can’t really give a proper response to any major injuries, but it’ll answer anything non-life-threatening in an instant. 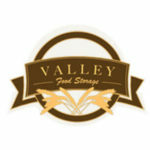 The content of the pack is neatly packed together, so you can access anything you need without any hassle. If you take a look inside, you’ll see an eye wash, 2 x insta ice packets, 1-3 inches ACE Bandage, bandage scissors, a comprehensive guide on giving first aid, CPR mouthpiece, 3 x perp iodine pads, 6 pairs of latex gloves, 2 x water gel, 3 x 2″ x 2″ and 4″ x 4″ gauze pads, a pack of tissues, 6 x prep alcohol pads, 10 yds of adhesive tape, a waste bag for infectious material, a box of bandages (¾” x 3″), tweezers, Purell, 2 x eye pads, 6 x wet naps, hydrogen peroxide, and combine dressing bandages (5″ x 9″). As the specification claims, this is definitely not your run-of-the-mill everyday first aid kit. It also doubles as a personal hygiene survival kit. The essentials of both worlds are there. It’s also the first product in this first aid kits review to feature an eye patch. Definitely not a laughing matter, but kinda cool. The medical attention part of the story – 2 x Q-tips, a 5″ x 9″ bandage, 3 x regular bandages (2″ x 2″, 3″ x 3″ and 4″ x 4″), a pocket tissue, 6 x alcohol wipes, Aspirin, cold relief, Ibuprofen, antacid, non-aspirin, 6 x antiseptic wipes, a CPR mouthpiece, 3 x antibiotic ointment, 6 x antimicrobial wipes, bandaids, a burn free and 3 x small burn free, Blistex, Gauze, scissors, 2 x ½ yd tape, tweezers, a chapstick, hydrogen peroxide, 2 x sting relief, a triangular bandage, 2 x nitrile gloves, 6 x butterfly bandage, and 3 x patch bandage. As for personal hygiene items, you get a toothbrush and paste, hand sanitizer (2 oz), a hand lotion, a comb, 2 x blue mask, and a sunscreen. The kit also comes with a full 63-page user manual. This is the second of the two most convenient kits on the list. Even though the exact size remains a mystery, it’s pretty compact and can almost fit in a regular pocket. As its predecessor, it’s made for simpler procedures and will fall short if tested against potentially fatal fractures or lacerations. Inside the kit, you can find 2 x insta ice packets, 6 x 2″ x 2″, 23″x 3″ and 4″ x 4″ gauze pads, 12 x antiseptic wipes, 12 x alcohol wipes, 6 x iodine wipes, a burn cream, 12 x wet naps, 2 x large patch bandages, 12 x bandages (1″ x 3″ and ¾” x 3″), 4 x pack of non-aspirin, bandage scissors, 2 x adhesive tape (½” x 2 yd), 6 x knuckle bandages, 4 x tongue depressors, 6 x finger bandages, 2 pairs of latex gloves, tweezers, 6 x butterfly bandages, instructions on how to use the kit and everything in it, and 2 x combine dressing bandages (5″ x 9″). This is an upgraded version of the product. The contents are nothing short of impressive. They’re segmented into several groups, corresponding the most common of injuries. 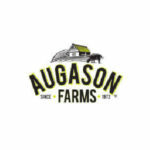 Bandage materials – 16 x adhesive bandages (1″ x 3″), 1 x adhesive bandages (2″ x 4.5″), 4 x adhesive knuckle bandages, 12 x plastic adhesive bandages (3/8″ x 1 ½”), 4 x butterfly bandages, 4 x sterile gauze (2″ x 2″, 3″ x 3″ and 4″ x 4″), and 2 x sterile dressing (2″ x 3″). Bleeding – Trauma pad (5″ x 9″) and a pair of nitrile gloves. Burns and blisters – 11 pieces of pre-cut and shaped moleskin. Sprains and fractures – A cold pack and 2″ elastic bandage with clips. Instruments – 2 x safety pins, forceps for removing ticks and picking out splinters, and bandage-cutting scissors with a blunt tip. Medication – Aspirin (325 mg), 3 x Acetaminophen (500 mg), 3 x Ibuprofen (200 mg), and 3 x Antihistamine (Diphenhydramine 25 mg). Other – Relief after insect bites. Wound Care – 12 x antiseptic wipe, adhesive tape (½” x 10 yds), 2 x cotton tip applicator, and 4 x single-use triple ointment (antibiotic). 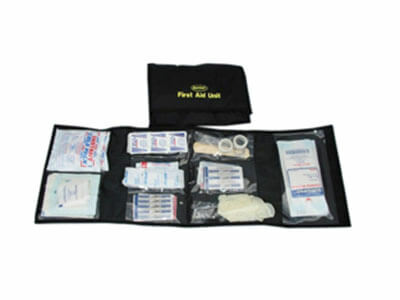 This is a pretty handy first aid kit, reminiscent of tool cases at first glance. It can be mounted on the wall for easier access or stored on a shelf. Detaching the wall mount will save some extra space. We don’t like seeing products with unspecified weight since every single pound matters in a survival situation. Here’s what you get with this bundle: 30 x adhesive bandage (3″ x ¾” and 3″ x 1″), 20 x adhesive bandage (1 ¾” x 3/8″), 3 x bandages for fingertips, knuckles, and with butterfly closure, triangular bandage and a tape roll, 4 x gauze pad (2″ x 2″, 3″ x 3″ and 4″ x 4″), gauze rolls (2″ and 3″), 4 x examination gloves, insta cold pack, tweezers, 6 x first aid and burn cream, 5 x pads for sting relief, 20 x antiseptic towelettes, 10 x alcohol pads, 20 x cotton tip applicators, elastic bandage (2″), CPR barrier, and a filtration mask. On top of this, you’ll also get a comprehensive instruction manual on how to use all of the supplies offered by the kit. If this first aid kits review did one thing, it should be showing you just how important first aid really is in a survival scenario. A minor injury can mean all the difference if not treated properly and immediately. A minor injury can become almost an insurmountable obstacle when it all hits the fan. So, don’t let a nonlethal laceration or a simple sprain stand between you and everything we’re prepping for. Preppers usually focus on the flashy stuff; the guns, the tactical outfits, and the shelters. They forget a simple bee sting can collapse everything like a house of cards. What’s your fancy gun gonna do against that? The key to everything is mastering the tools you need for immediate medical attention. If you have a family tagging along, they need to know everything as well. It takes about 1000 repetitions for a move to enter our muscle memory. You’re not ready until you’ve reloaded your rifle 1000 times and shot it. 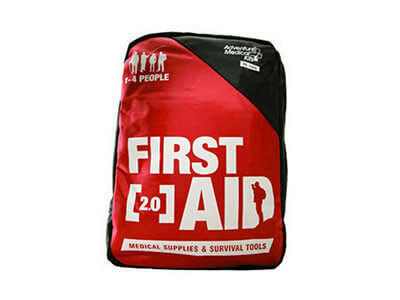 You’re not ready until you find and remove the stoppage 1000 times… It’s the same with first aid. You can get cheaper first aid kits and practice alongside your family. Practice wrapping bandages, giving CPR, stitching wounds, immobilizing different parts of your body, and even washing your eyes (this one is particularly important since you need to adjust your eyes to outside influences). Once you’ve done everything 1000 times, you can call yourself ready in this area of survival and head on to the next one.